Mobiefit, a fitness mobile app company which is backed by Gul Panag have launched their free app on Google Play store. 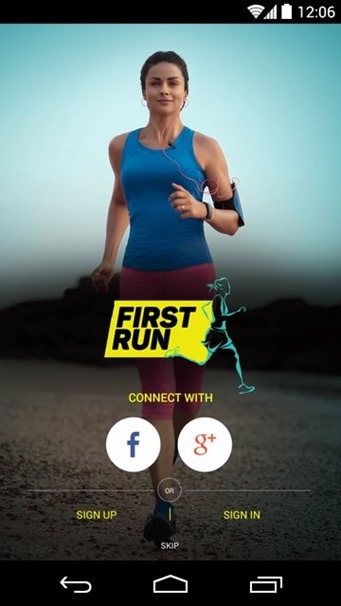 Called FirstRun, the app is designed to make runners out of those who’ve never run before in their lives. If you are someone who wants to run a marathon and have never done it before, this app can serve as a great mobile personal trainer to prepare you for a marathon! Over last couple of years, fitness bands and apps have sprung up everywhere. Most of the top-rung mobile brands have come out with their fitness bands as well as apps. While FirstRun is also a fitness app, it is focused purely on runners and novice users who want to take up running as one of their fitness activities. Interestingly, Gul Panag acts as a virtual in-app personal trainer and guides users through the entire process to keep up the motivation of runners. FirstRun currently offers a 5K and a 10K running program, with plans for a half marathon training program in the future. The 5K program is based on Josh Clark’s Couch to 5K (C25K) running program, that has been used by thousands of runners to start their running journey towards fitness. The app features outdoor as well as indoor treadmill mode. Time Based — First Run does not focus on speed or distance, but encourages you to run for a set time each day. With a combination of walking and running, or even a jog, exercising becomes easier for users at any level of fitness. Unique Treadmill Mode — The app helps you irrespective of whether you are outdoors or indoors. It has a unique treadmill mode which gives runners guidelines on right treadmill speeds. In-app Music player — If you love music on your daily run, there’s an in-app music player as well. The app keeps a track of your daily running distance, speed and analyzes your progress in real time. With GPS tracking, you can set personal goals for each week and see how much distance you have covered without checking google maps. Prima Facie, the app looks good, and with pretty Gul Panag guiding you every step of the way, you should have enough motivation to prepare yourself for upcoming marathon. Download the app and let us know what you feel. Delhi Govt To Roll-out Free WiFi On Usage Basis & Not Time Limited! Would like to get in touch with the Editorial Staff.